All the hints of Spring coming are starting to get to me. 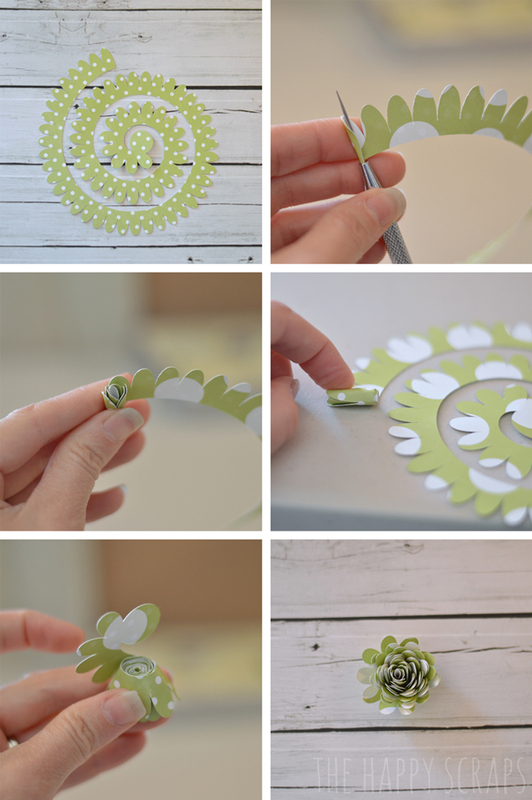 I decided that I needed to do something about it, so I put this Paper Flower Spring Centerpiece together. It’s got me excited for Spring to get here. Is anyone else excited for Spring? What do you do to bring Spring into your home? One of the first things I think about doing this time of year is bringing color inside. I love color, and after a long cold winter, I look forward to lots of colorful things. Today’s project is the perfect thing to bring fun colors into your home and help get you ready for Spring! 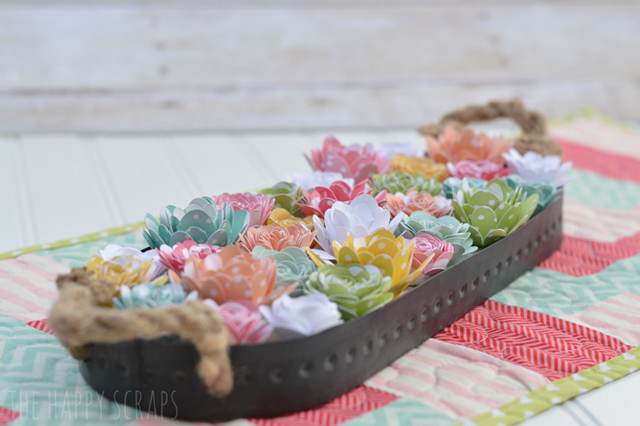 I’m so excited to be sharing this on The Happy Scraps today! With my Cricut Explore machine, I cut several flowers out of all different papers. Using a paper piercer, I started rolling them really small. Once I got far enough with the rolling, I was able to just use my fingers to roll the paper. For some flowers, it was easier to lay it on the table and roll. Once you get to the center, you can let the flower loosen a little bit if you’d like, and then glue the larger circle to the bottom of the flower. I found that glue dots worked really well. Once all the flowers are put together, you are ready to put them in the container. I chose to use this fun oval shaped tin, that I purchased from Pick Your Plum. I cut some foam core board to put in the bottom of the container, so the flowers would show over the top. Once I had the foam core board as tall as I wanted, I put some coordinating paper down on it. Then I was ready to glue the flowers down. I just used my hot glue gun. And here is the finished project! Those flowers make me want to squeal! I love the character that the tin tray adds. Isn’t it so fun?! I love fresh flowers, but I’ll be able to enjoy these for a few months, and not have to throw them out. Or even enjoy them all year long! What kind of fun and bright colored Spring decorations do you like to put up? i just got those trays from pickyourplum.com – thanks for the idea to use them! I LOVE this Amy! 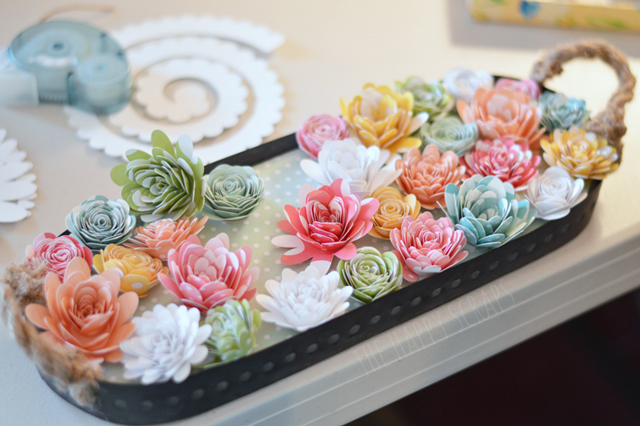 I have made the paper flowers before by cutting by hand. This looks so much easier. I am going to have to really look into the new Cricut Explore. I seriously love this Amy! So beautiful! I’m serious – this is my all time favorite thing I think I’ve ever seen. LOVE it. Oh man, how did I miss those trays? Danggit. I love your colorful flower display. Spring is awesome! I love the Spring centerpiece! It’s perfect for Spring and Summer. Enjoy the last day of winter!!! This is so cute! I have to get a cricut! Some of my crafty friends have one and they rave about it! I think that this is so pretty! I love paper flowers and you did a great job. What a beautiful job! I love how nice looking they came out. I love stopping by and feeling inadequate. 🙂 Your projects are absolutely amazing and this is so beautiful. Great job! This is just lovely!! I love all the colors! Beautiful display! 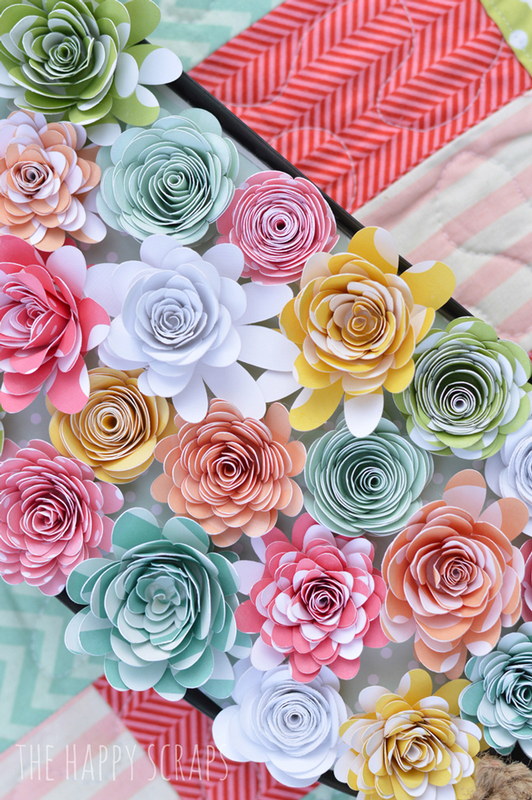 These are my favorite paper flowers I have seen in a while! Gorgeous. thanks for linking over at Take-A-Look Tuesday via Sugar Bee Crafts – – you were featured earlier today! I love all of your flowers. Gorgeous! This would be really pretty hanging on a wall or as a wreath. I love all the colors! This is such a gorgeous project!! Perfect for Spring!! 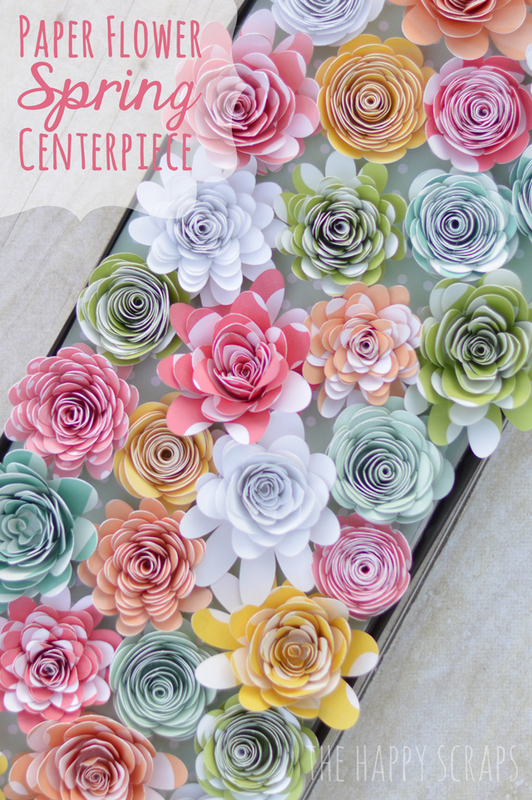 This is so gorgeous… So perfect for spring….. Those flowers are like little tiny pieces of art……!!! Wow – this is absolutely gorgeous!!! LOVE ! And pinning ! Hi Amy, this is just gorgeous and I absolutely love it! visiting from Uncommon Designs – thanks for sharing and have a happy Monday! This is too cute, I totally love it! And it’s perfect for spring! I featured this on my blog today and I’m just stopping by to pin it! Beautiful! Which cartridge did you use, or is it a built in feature of your machine? Beautiful quick question can this be done with the original cricut machine? So colorful!! Really cute Spring pretty up! Sharing this cute projecto on fb today!! This is so pretty! Found your blog through the Twin Dragon Fly Designs link party. Love it! Subscribed by email. What a cool idea. The flowers are so pretty. I love the display. 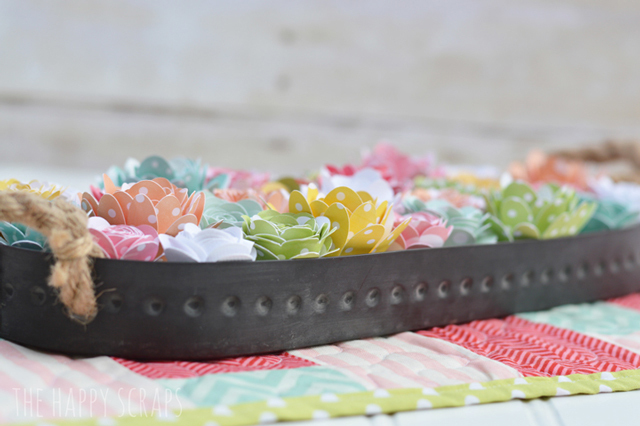 May I ask where do I find the pattern for the flower template? Is it an available template from a website or is it from a cricut cartridge? Thank you. One of the flowers is on the Close to my Heart – Art Philosophy Cricut Bundle Cartridge, the other three designs that I used are on the Flower Shoppe cartridge. 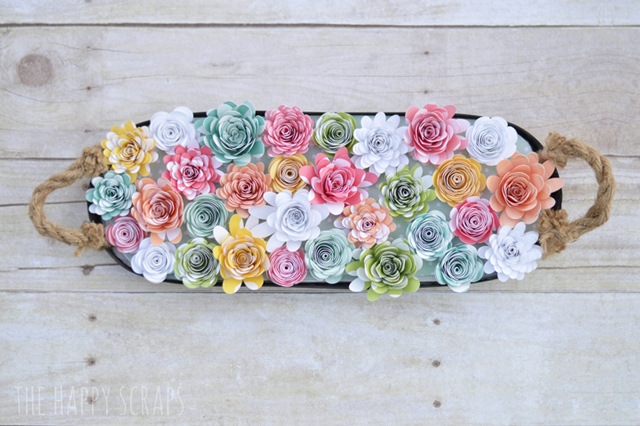 I believe that you could purchase the flowers from the Flower Shoppe Cartridge individually if you are using Cricut Design Space, but you would need to purchase the full cartridge for the flower used from the Close to my Heart cartridge. From what I understand, you can’t purchase that cartridge from Cricut, you have to get it from a Close to my Heart consultant. Oh my gosh, so pretty! I love faux flowers. Perfect for Spring! Visiting from Welcome Home Wednesday. Hi! I’m one of the co-hosts from the Welcome Home Wednesday Link Up. I am in love with this beautiful centerpiece. It’s so bright and cheery. I love that it can be re-used over and over again. Thank you for sharing! This so pretty! Love it! Thank you for sharing on Merry Monday! Have a great week! Sharing on Twitter!